Well, my first weekend on the diet went well. I only cheated once--and I wouldn't necessarily consider it cheating. I feel like I should be entitled to ONE healthy meal per week, because, I get enough exercise to not only counteract the extra calories, but also, a 25 year old girl's gotta live a little. So instead of eating pizza and burritos and whatever else sounds absolutely mouth watering, I ate a grilled chicken spinach pesto panini. Not bad, right? Or am I delusional. I did all the research for how many calories I was ingesting, and I made up for them by working out. Still though, don't tell my doctor. Anyways, I saw the above meme and realized I hadn't even delved into that arena yet. As a fat girl, I am painfully familiar with standing in a group of girls picking themselves, and their bodies, apart. Because I am aware of my size, I literally never complain about it. It’s as simple as me being worried that it will call more attention to my size than there already is. Ask my boyfriend, ask my mom, ask anyone that knows me. Under zero circumstances do I ever even hint that I am insecure about my size, despite it being the biggest (no pun intended) insecurity I have. So when I stand there, hearing girls who are easily more than 100 pounds lighter than me saying they are “fat”, murderous thoughts begin to stir within me. How can anyone thin, who is vain enough to think they are “fat”, have the audacity to talk about being “fat” in front of me, a fat girl. It’s ridiculous. 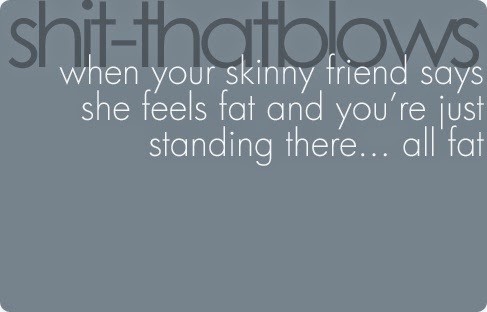 Beyond that, if they truly feel they are fat, what does that make me?! A planet? Maybe they don’t realize it, but they are blatantly insulting me, directly to my face, in this weird passive-aggressive way. Most of the time I just let them talk, but sometimes I have the balls to voice my thoughts, to point out how absolutely, disgustingly, insensitive they are being. Then again, maybe I’m just sensitive. After all, it isn’t their fault I’m fat. They are allowed to feel insecure about their weight, even despite my presence. I don’t want people to tip toe around me for fear of rousing some fat girl attitude. I don’t know. It still bugs me more than words could possibly describe. Maybe it is because I, personally, try to be sensitive of those around me. I’m not going to complain about my essentially flawless skin having one tiny blemish (that may or may not be visible to others), when someone with severe acne is standing right next to me. I’m not going to complain about my teeth being one shade too yellow, when there is someone with an obviously horrendous grin near me. I don’t know if my awareness of others’ feelings is a direct result of my current size, but it makes sense. When you have a visible fault, you can’t run from it. The whole world knows I’m fat, just like the whole world knows that kid has a face full of acne, or the other with a messed up smile. I know what it feels like to have someone, intentionally and unintentionally, make you feel bad about yourself. It doesn’t feel good, and I wouldn’t want to inflict that on anyone, so I make a point of thinking my thoughts through, before running my mouth. I’ll never understand how a seemingly physically perfect person could feel it necessary to comment on any insecurity aloud. Maybe that is their physical imperfection. They are so worried what others are thinking, they have to pick themselves apart for approval. You can bet your bottom dollar I wouldn’t start telling people how fat I feel, because what are they supposed to say, no? That’s ridiculous, and I’d be mad at them for lying. I know I’m fat, but I’m working on it. And you know what, I’m happy that way. My imperfections are relatively easy to resolve. People who find it necessary to have the approval of others, when they are already at the ideal body weight, have a much, much harder transformation ahead of them. Vanity isn’t flattering, and it’s much more difficult to shed than some extra weight. Great post.. I live it daily!